And believe me, I’ve done a lot of cardio as a former pro soccer player. Yet even then, most of our training was built around interval training. Thankfully, our coaches knew what the heck they were doing. Sadly, most people don’t, especially when it comes to weight loss. That’s why I’m writing this post specifically on interval training for weight loss. As you read through, I’ll show you how to use a specific type of interval training to lose weight in just 3 minutes! I’ll save the technicalities of interval training for another post. Here, just know that interval training is simply a type of exercise (usually cardio) that involves performing repeated bouts of high and low intensity activity. So if you’re running this could mean sprinting then jogging, then sprinting again, and so forth. In general, the fitter you are, the lower the rest-to-work ratio needs to be. For instance, if you’re super fit, you could have a rest-to-work of 1:2 (meaning you work TWICE as long as you rest), while an unfit beginner is best start off at 4:1 (4 times longer recovery than work). As you can probably tell, there are thousands of different interval training protocols. You can see these take far less time than traditional cardio workouts, and they yield far better results for weight loss and health improvements. But… is one interval training workout more suitable for weight loss than the next? Well, the answer is YES (although with any interval training workout you’ll still see great results). But let’s assume you want the best of the best, shall we? There’s quite a bit of research research which shows that work intervals of less than 15 seconds in length are better for losing weight. Because they tend NOT to increase lactic acid build-up in your muscles. The reason this is important is because lactic acid seems to inhibit your muscles’ ability to utilize fat as fuel. However, when lactic acid is not present, muscle cells are able to use free fatty acids more readily. Research published in the European Journal of Applied Physiology compared the fat-burning effects of two different interval training workouts, both lasting 40 minutes. The first consisted of short intervals lasting 6 seconds, with 9-second rest periods. The second workout involved long intervals lasting 24 seconds, with 36-second rest periods. It’s important to note that the treadmill speed was identical during both the short and long interval workouts. Moreover, the ratio between work and recovery bouts was also the same (ie. 2:3 work to rest), meaning that the total amount of time spent running on the treadmill (16 minutes) was also identical. To understand why the short intervals were so much more effective at increasing fat loss, it’s important to understand a little more about a substance called myoglobin. Myoglobin is a large protein that binds to oxygen inside your muscle cells. Think of it a little like a “reserve” oxygen supply. As the blood has hemoglobin, the muscles have myoglobin. Both store oxygen. It is repeatedly used and reloaded during the work and recovery phases of interval exercise. However, as the duration of the work period increases, myoglobin’s oxygen stores are reduced. Your body needs more oxygen to burn fat as a fuel (compared to carbohydrate or protein). When oxygen supplies become limited, carbohydrates then provide a greater proportion of energy. Notice how at higher intensities, the body prefers carbohydrates as the main fuel. But BE CAREFUL, this does NOT mean that you’re not losing more fat overall, compared to low intensity exercise. Now, because lactic acid, a by-product of carbohydrate metabolism, “blocks” fat burning, intense intervals that continue beyond the point at which myoglobin loses its supply of oxygen (usually above 15 seconds or so) rely to a greater extent on carbohydrate as a source of energy and, thus, don’t burn as much fat as shorter intervals. As mentioned, because myoglobin holds enough oxygen to last for 5-15 seconds, it makes sense to perform short, intense intervals rather than long intervals to promote a greater rise in fat burning. As such, if you’re doing interval training for weight loss, you might get more bang for your buck by doing high intensity intervals that are no longer than 15 seconds. The other benefit to these super short “start, stop” intervals is they don’t feel as physically demanding as long intervals that never seem to end. This means you can get better results without feeling like you’re working harder. With all that short duration talk, the reality is that you will still burn fat doing intervals that are longer than 15 seconds… as long as your intensity is high—and far more than going for a slow jog that breaks your body down with each pounding step. It all has to do with the fact that high intensity interval training allows you to spend more of your time at higher intensities or closer to your maximum heart rate. Notice how even though you’re breaking up your intense bouts with low intensity recovery, your average heart rate drifts higher through the workout. This is good! As mentioned, with interval training you have bouts of high intensity followed by bouts of lower intensity. It’s these lower intensity recovery bouts that allow you to bounce back and get right back up to near maximal exercise intensity. And that makes sense because you couldn’t sprint for 10 minutes straight – but you could certainly sprint several times for 10 seconds each by throwing in some recovery intervals into the mix, right? When you spend more time near your maximum heart rate, you increase your maximum aerobic capacity (known as your VO2 max), burn more calories, and improve almost every physiological marker of improved health and performance. Sadly, many doctors tell their patients (especially older ones) that they shouldn’t push themselves to these levels. I disagree. I’ve personally worked with many people beyond 60 years old who, by adopting this “train less but more intensely” idea, are in better shape and health now than they were in their 20s! Your body is remarkable. It will improve based on the stimulus you give it. So, train low intensity and that’s all you’ll be able to handle. But train with intensity (get really out of breath), and you’ll be able to handle anything life throws at you (including a slimmer pair of pants)! If you want financial wealth, then you need to have money working for you while you sleep. If you’re trading time for money, that’s simply not going to happen. The same goes for weight loss. If you want to lose weight and keep it off, then you better be darn sure you’re investing in your body with the right type of exercise that will ensure you burn fat 24/7. And that type of exercise is not 30 minutes of cardio 5 days a week. That’s really nothing more than a wrecking ball for your body. Long, slow cardio is nothing more than a short term “dietary repent” (in most cases). Using a financial analogy, it’s like playing the slot machines, while high intensity, short duration exercise is like having the best financial advisor working miracles for you. High intensity intervals – yes even the ones under 15 seconds – increase your body’s metabolic rate for several hours AFTER you’re done working out. This is a phenomenon known as “excess post-exercise oxygen consumption” (or EPOC). This refers to the amount of oxygen your body must recover after exercise to bring itself back to balance (homeostasis). Some studies have even shown an EPOC lasting 36 hours after a workout. And keep in mind that 75% VO2max is no where near 100% effort. Now, we’re not talking 1000’s of calories being burned with EPOC, but even a few hundred makes a huge difference, especially if your diet is already pretty clean. Basically, you could train intelligently 3-4 times per week for no more than 90 minutes total (weights and intervals included) and spend the rest of your week chilling out, walking around, and living life… and you’ll be more likely to be lean, strong, and healthy compared to the poor souls burning themselves out 7 days a week in the gym. As you’ve probably gathered by now, you don’t need a lot. Really, you can see an incredible change in your measures of endurance and fat loss (and weight loss) with just 2-3 interval workouts per week, last anywhere from 5-15 minutes each. Seriously. In fact, a 2006 study in the Journal of Applied Physiology examined the effects of just 7 interval training sessions over 2 weeks on skeletal muscle, aerobic endurance, and fat burning adaptations among women. The results? Insulin sensitivity is a very important because if your cells are NOT sensitive to it, they can no longer take in glucose from your blood. This turns into something called insulin resistance or type 2 diabetes. It appears as though high intensity interval training primes your muscles to soak up blood glucose due to the glycogen-depleting nature of the higher intensity exercise. Again, an amazing health benefit you do not get with low intensity cardio. As you can see, interval training is the most effective and time efficient way to whip your body into shape and burn fat during and after your workout. And for an extra fat loss boost, focus on work intervals that last LESS than 15 seconds (to avoid lactic acid build-up). Now, if you’re doing super short duration intervals, running on the treadmill is probably not your best option. That’s because most treadmills take a long time (usually more than 10 seconds) to reach full speed, meaning you’d be finished your work interval before the treadmill even reached your cruising speed. So, if you’re running, do it outside—and preferably on a level grass field (less impact on your body). Otherwise, do these intervals on any cardio machine or with any bodyweight exercises like jumping jacks, burpees, or my favorite – jumping rope! Whether you’re just getting started with interval training or you just want some new ideas for losing weight, give these workouts a shot. 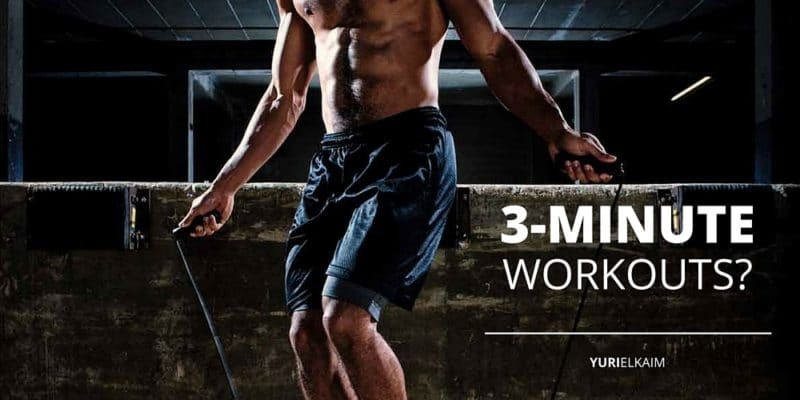 And don’t forget to download my FREE “interval speed burst” workout at the bottom of this page so you can experience an amazing 5 minute interval workout with me right over your headphones coaching you each step of the way. No matter which variation you choose, you’ll burn fat and you’ll improve your aerobic and anaerobic fitness significantly at the same time. Bottom line: my best advice is to use a combination of different interval training workouts. That way your body never gets used to what you throw its way. Variety is an important component to progressing and not hitting a plateau. Did you enjoy this article on How to Do Interval Training? You might also like my Interval Speed Burst Workout that burns more fat than cardio, while also improving your cardio endurance. Click the banner below to get it for FREE. Did You Know About These Negative Effects of Drinking Coffee?